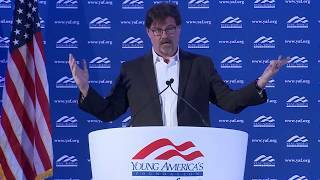 A bestselling author and widely syndicated columnist, Jonah Goldberg is one of the most prominent political commentators in America today. A Fox News contributor and regular “Fox News All Star” on Special Report with Bret Baier, is known for blending humor and insight on the pressing issues of the day. Goldberg is a contributing editor to National Review, was the founding editor of National Review Online. He is also weekly columnist for the Los Angeles Times and his syndicated column appears regularly in the Chicago Tribune, Philadelphia Inquirer, San Francisco Chronicle, Kansas City Star, St. Louis Post-Dispatch, Washington Examiner, Miami Herald, Manchester Union Leader and scores of other newspapers. A fellow at the American Enterprise Institute, Goldberg was named by The Atlantic as one of the top 50 commentators in America. His first book, Liberal Fascism: The Secret History of the American Left from Mussolini to the Politics of Meaning (Random House/Doubleday) was a #1 New York Times and Amazon bestseller. “Those who value substance over words… will find in this book a wealth of challenging insights, backed up by thorough research and brilliant analysis,” raved Thomas Sowell. “This is the sort of book that challenges the fundamental assumptions of its time…Jonah Goldberg’s Liberal Fascism is too rich a book to be summarized in a newspaper column. Get a copy and start rethinking the received notions about who is on ‘the Left’ and who is on ‘the Right.’ It is a book for people who want to think, rather than repeat rhetoric.” His most recent book, The Tyranny of Cliches – How Liberals Cheat in the War of Ideas was an instant bestseller. Goldberg is currently a member of the Board of Contributors to USA Today. In the past he’s served as a media critic for both Brill’s Content and The American Enterprise and a Washington Columnist for the Times (of London). He has written about politics and culture for The New Yorker, The Wall Street Journal, The LA Times, Commentary, The Public Interest, The Wilson Quarterly, The Weekly Standard, Slate, TheStreet.com, New York Post, Women’s Quarterly, and Food and Wine. Goldberg is a regular political commentator on CNN and has served as a guest host on Crossfire and as a regular panelist on Wolf Blitzer’s Late Edition. Other television appearances include Good Morning America, Larry King Live,Today, Nightline, Hardball with Chris Matthews, Hannity & Colmes, The Daily Show, Real Time with Bill Maher, Special Report with Brit Hume, Geraldo, NBC Nightly News, and numerous other television and radio programs. He was senior producer of the award-winning series Think Tank with Ben Wattenberg on PBS. He has written and produced several PBS documentaries and specials. A popular speaker on college campuses, Goldberg is proof that reading and thinking about political, media and cultural issues can be enlightening and entertaining at the same time. Among other awards, he is the recipient of the Lowell Thomas Award and the CPAC Conservative Journalist of the Year award.